Bloat is one of the most serious health conditions that can affect your dog, and it is imperative that you know what it is and how to recognize it. In this article you will find exactly what bloat, (otherwise known as gastric dilation and volvulus) is, along with the causes of bloat. You will see all of the symptoms of bloat, being alert to them if your dog shows any of these signs. More importantly you’ll know what to do, with both immediate veterinary treatment, and holistic options. 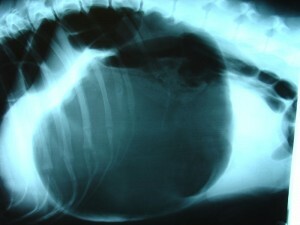 Bloat is most often seen in deep-chested dogs such as Great Danes, Dobermans and German Shepherds. Some reports claim that it is the second leading cause of death in certain breeds next to cancer. The stomach distends in response to digesting food and gas production. Some dogs produce more gas, and are more prone to bloat. Following the gas distension, the stomach can twist, called a ‘torsion’, and then the built up pressure can’t escape. This compresses a large vein, the caudal vena cava, cutting off the blood supply to the rest of the abdominal organs. The symptoms of bloat show as your pet’s stomach is swollen with air and fluid. You will see the belly expanded and feel firm like a balloon. Your dog is anxious, very restlessness, and often will appear hunched up. A classic sign which I saw many times in veterinary practice was of a dog attempting to vomit very frequently ( every few-10 minutes), with nothing coming up. This usually happened very suddenly, and often after eating or drinking. As the bloat continues, your dog is in pain, drooling, and trying to vomit. Then this further progresses to signs of shock. The distended stomach loses its blood supply, and causes a loss of blood flow to the rest of the abdominal organs. There can be faster heart rate, pale to grey mucous membranes, weakness and collapse. Call your veterinarian as soon as possible if you suspect bloat. Pets can die in as little as 15 minutes following a torsion. Your veterinarian can assess your dog, perform an X-ray to confirm the bloat, attempt to pass a stomach tube to relieve the pressure, and if needed, perform surgery to correct the torsion. In the early stages of bloat, the stomach is distended, but your pet can belch; this means the stomach hasn’t yet twisted. Products that contain antacids and simethicone, a foaming agent that pulls gas bubbles together, may help. You can safely give a liquid antacid – Mylanta is very effective. The dose is 1 tablespoon per 10 lbs (your 80 lb Labrador would need 8 tablespoons). Or, you can give the tablet form – ½ tab per 10 lbs. The stomach swelling should start to decrease in 15 minutes. If the swelling doesn’t drop, then contact your vet. Gentle exercise can help move distended fluid and gas through your dog’s system. I find this helps my own dog after he has gone through the neighbor’s compost. After 15 minutes the swelling should be gone; if not, see your vet now. Many a dog owner claim that acupressure helps with preventing the expanding stomach from twisting, reversing the signs of bloat. ST36. Found on the outside hind leg, below the knee, in a depression at the front of the leg. Hold it for 60 seconds, and repeat every 5 minutes. This last technique is reserved for pet owners who have a dog prone to bloat, especially if you live a long way from a veterinary clinic. In an emergency, I would put a roll of tape in your dog’s mouth, and pass a semi-rigid tube (such as a watering hose). The tube can be pre-measured to the length of the last rib. It should pass into the stomach with moderate pressure, and result in a large release of gas. After this, get to your nearest veterinarian ASAP. You should now have a good understanding of what bloat ( Gastric dilation and volvulus) is, and be able to recognize the common signs and symptoms if it is to ever affect your dog. One of the more diagnostic signs is sudden, and frequent attempts to vomit, while nothing come up. If your dog has signs of bloat, immediately contact your veterinarian, and in the interim, consider some of the natural remedies, such as the ST36 acupressure point. Great article! Does it matter how fast a dog eats, and should you or should you not put water on dry food? I have heard different things about that – to try to decrease their chances of bloating. THanks. One of my Bozers had to have surgery for Pyloric Stenosis. Is this the same thing? Dr. Jones: Our 10 year old Yorkie has a collasping trachea. He coughs like a smoker and wheezes sometimes when he is asleep. We feel very helpless! Is there anything we can do to help him? Thanks for this article, Dr. J…. Please, everyone, this is absolutely a LIFE-THREATENING CONDITION! It can be EXTREMELY fast. TIME IS OF THE ESSENCE! Be alert to the signs! Don’t just assume “it’s just gas… she/he will get over it”. I lost my 11 year old Golden Retriever to this 4 years ago and I KNEW what to do! He was gone by the time I arrived at the Emergency Vet Hospital, which was not that far away. As a breeder and a great dane lover for more thatn 15 years, I can attest to you that accupressur point DOES WORK! Massage this point while on your way to the vet! Also, always keep with you, everywehre (house, car, boat, RV, etc) Gas X Maximum strengh. When in doubt, I give 6. Wait 10 minutes. If the dog is not farting, then 6 more…. and so on. This also give you time while getting to the vet. Your dog cannot do an overdose of simethicone, the active ingredient of Gas X (or Phazyme, Ovol and others) And yet, it is better than having a deceased dog.I found out that giving probiotics and digestive enzymes every meal help a lot. My dog, Elsie, died on July 20, 2012. She had been sick for several years with scratching. She had bald spots and the skin was red and black. Anyway, a couple weeks before she died, her stomach swelled up. It looked just like she was going to have puppies, which was impossible because she was spayed, plus the only male dog around that she had contact with was her littermate and brother, Charlie, who didn’t like her anymore and was always growling savagely at her. When they were pups, they were best friends. Anyway, this is off-topic, but I recently read on another website “Vitamin C Foundation” where a doctor treated several dogs that had distemper by using Vitamin C and he cured the distemper. Humans, fruit bats, guinea pigs, and primates are the only animals who don’t produce their own vitamin C.
Anyway, maybe there is something to this natural healing. Speaking for myself, with people doctors, in May and June 2012 I was in a lot of pain in my back, left hip, and left leg. It was so bad that I had to take pain killer to be able to function. I couldn’t walk without pain. I went to the Medical Clinic on June 25 for it and they took x-rays and prescribed anti-inflammatory and muscle relaxant,which didn’t help at all. I was still in a lot of pain. 2 months later I was still in lots of pain. Then one day I heard a doctor talking on the radio about vitamin C. I looked up his web site and ordered his vitamin C, calcium supplement, vitamin D, and Omega Krill. After I started taking those, the pain left. I’m still taking vitamin C. This is talking about high doses. One of the dr’s believes that diseases are actually scurvy. Anyway, after I was feeling better the medical clinic sent me a letter, saying I had an appointment to go for a CT scan on my lumbar spine. I didn’t go. That was my experience and I cured my pain myself using vitamin C, vitamin D, a calcium supplement (that is non-constipating) and Omega Krill. I am still taking Vitamin C and Omega Krill. Last winter when I wasn’t feeling good, I knew that if I took vitamins, I’d feel better. I was feeling like I had no energy, no pep. I was corresponding with a guy in China who claimed to be a doctor and he told me to take aspirin. I knew what to do. So anyway,this was my personal experience with people doctors and the medical system. I also forgot to mention that the last couple days before Elsie died, she smelled like rotten meat and one of my other dogs, Happy, was smelling Elsie’s rear end. Elsie must have died in her sleep. She was under the steps, curled up in a ball. It is more peaceful now without Charlie growling at her all the time.